Boy, I feel like this has been such a long time coming. The screen porch on this house was one of our favorite things about it and now it’s finally ready for us to use! Settle back with a cup of your fave beverage cause this is a photo heavy post. We moved into this house last September, when it was still plenty warm enough to enjoy the outdoors. I wanted to do something to make the porch usable, put I was so, so busy with unpacking and dealing with the remodel that the porch became a hodpodge of all of our outdoor furniture from the last house. Not pretty at all, but at least it was good enough for sitting outside. So, are you ready to see how it looks today? Let’s start with the wall that is immediately to the left as you walk out of the back door. I posted on Facebook, that I was looking for some shutters or bi-fold doors and wondered if anyone knew where to find some. Thankfully, a sweet friend alerted me to some at a Goodwill and I rushed right over to grab them. I had intended to use them above our fireplace, but they wound up making the perfect backdrop for this little chest and a piece of art. And bonus – no painting needed! The shutters aren’t even attached to the wall. The chest holds them in place just fine. 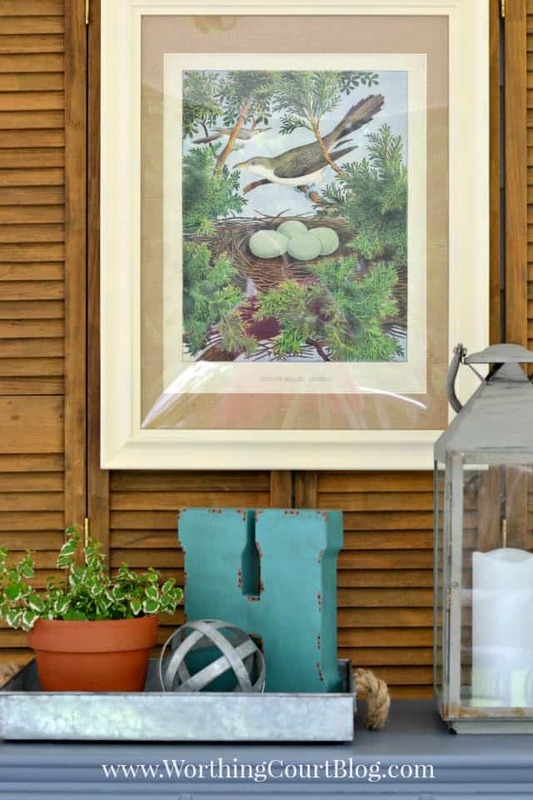 A free printable was exactly what I wanted for some art on the porch. I used PicMonkey to enlarge it to fit into a frame that I already had, downloaded the re-sized image to a thumb drive and took it to my local FedEx for printing. I planned on making my own burlap covered mat, but found out that Hobby Lobby carries them and would cut it while I waited. You can find the printable HERE. My gardening hat hangs right beside the backdoor so that I can quickly grab it when I’m on my way out to work in the yard. And I love the North Carolina HOME sign that I found at a recent barn sale! I’ll be sharing that with you soon. One of the holdups with getting the porch pulled together was making a decision about some outdoor wicker chairs that we already owned. I hated to spend money to replace them because the frames and wicker are in good shape – plus they’re very comfortable. But the cushions looked awful and were an odd shape that I couldn’t find replacements for. I first tried spray paint on the cushions (cause you know I’m a lazy painter), but one whole can of paint wouldn’t cover the print on just one the cushions. Chalk paint to the rescue. Two coats of ASCP in Duck Egg took care of faded and grody, old, ugly cushions. Adjacent to the wicker arm chairs, are wrought iron rockers that lived on the deck at our last house. All they needed were some new cushions and throw pillows from Target to give them new life. A couple of outdoor poufs from Target are good for putting your feet up or act as extra seating. My friend, Nancy, gifted a candelier to me that she was no longer using. The garden stool that it hangs over lived in the foyer of our former home. The addition of some round wicker trays to the columns helps to give some definition to the area and makes it feel more like a room than just a wide open space. And here’s my spot – the chair on the left. It’s the place that allows me to look out over the backyard and the flowers and feeders on the deck. It’s where I put my feet up at the end of a long day and enjoy some of my favorite magazines. See my little photo bomber? Pookie and I eat a lot of meals out here on the porch. Believe it or not this round table used to reside under a tablecloth in the basement family room at our last house. The last wall of the porch looks out onto our deck. I didn’t place any furniture here because it acts as the walkway from our back door out onto the deck. A rustic grapevine wreath helps to define the space though. Thank you for stopping by for a visit on our porch today. Come on by anytime to ‘set a spell’ and enjoy a glass of sweet tea! Click HERE to see all of the awesome places where I party! It looks great! 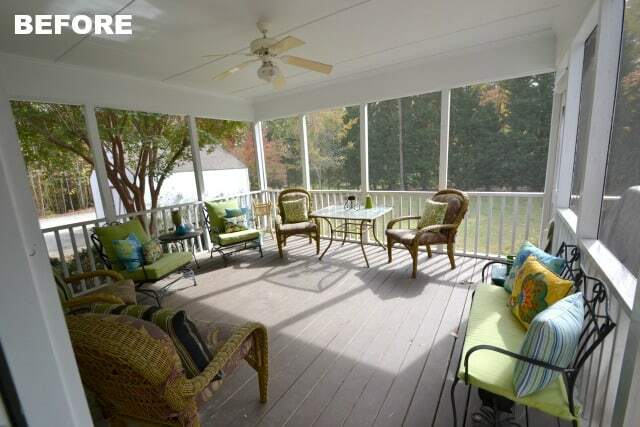 That’s the one thing this house didn’t have that I wanted… A screened porch. Maybe I’ll come borrow yours! Now THAT sounds like a plan. Come over any time! I’m love, loving your screen porch. It looks like the perfect place to begin and end a day. Actually, I’d probably spend the whole day there. 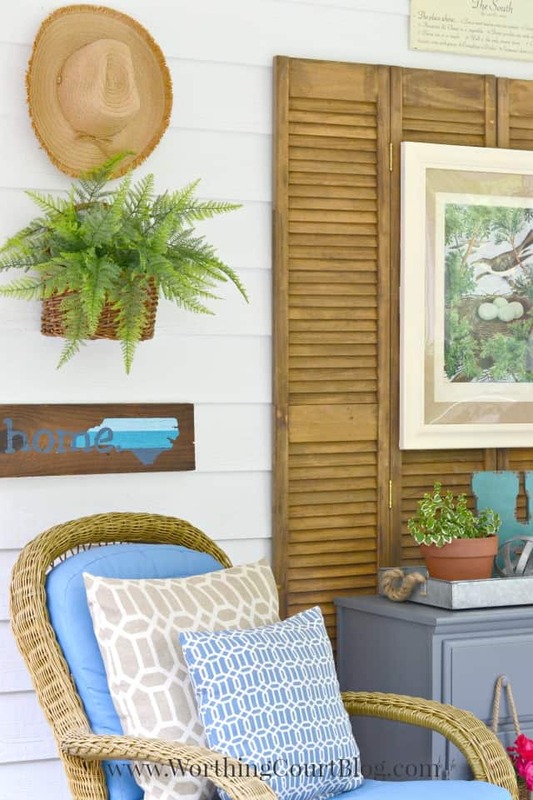 Love the shutters and bird print. Awww…thank you, Babs. I actually do spend way too much time out there! Wish you could come for a visit. Thank you, Rita. That’s too funny about my little photo bomber! I saw the add after the post was published and realized that it was covering her up! When I was little, I used to LOVE that feature in Highlights. I love this, Suzy. The shutters behind the chest is perfect. Hobby Lobby has burlap mats? Nice to know. Love your porch. Thank you, Kim. The mat was surprisingly affordable! Thank you, Girlfriend. I may have a screened porch, but you have the most awesome deck ever! I have 4 outdoor spaces to organize and decorate so you have definitely given me inspiration and ideas. I especially love the grapevine wreath! Thank you, Windi! I’m actually going to do a tutorial for how I made that wreath. It was easy! The pictures you have shared of your house are lovely, but your porch? Oh my goodness, what an incredible place to relax! I would sit down and never leave! Just wonderful, and those shutters are perfect, especially with the art and chest. Thank you so much, Jae. Trust me, the porch calls my name all day! This is such a lovely space! 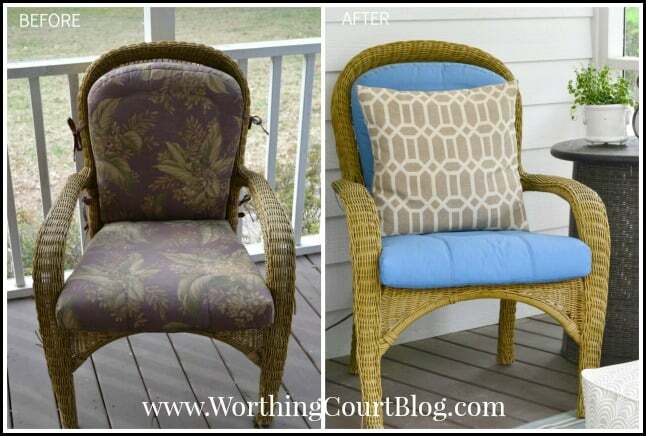 I can’t believe you painted your cushions – I would never have thought of that!! They look great! Thank you, Michelle. I was surprised at how easy it was to paint the cushions! I thought they would turn out crunchy feeling or that the paint would crack, but they’re totally perfect. Your porch is lovely a great place to start your day off and end a day. Thank you, Denise. It’s a great place for my morning coffee, that’s for sure! Thank you, Cindy! I’m glad that you like it. I already commented on your Facebook page but have to reiterate what an amazing job you did! I’ve seen fabric that’s been chalk painted, how will you protect it from wear? Will it hold up without wax or spray sealer? So glad you like the porch, Terri! This was my first time painting on fabric with chalk paint and I’ll admit that I was a little skeptical. I guess time will tell about the wearability, but so far so good after several weeks. I decided not to wax them for two reasons: #1-I’m lazy ;P and #2-the person at the chalk paint store told me that it wasn’t necessary. I also painted cushions for chairs that sit out in the wide open on the deck and they look just like the day that I painted them even though they’ve been rained on several times. The sales person told me that the secret to “curing” the paint on the fabric was to let them bake in the hot sun for several hours. Well, if it’s one thing we have in the south it’s plenty of sun for baking – They look great – you took the fear out for me, thanks! This space looks great! I was curious also, how does the chest of drawers do on the porch? I was thinking about doing something similar, but am a little paranoid on how it might take to the elements if the weather outside is colder or if it starts raining. Hi Jessica. I had the exact same concern as you about how this piece would do out there. So far, it’s done just fine. I think the secret is placing it where it won’t get rained on. It doesn’t seem to be bothered at all by humidity or cold temps either. Wow! This is so adorable and inviting. 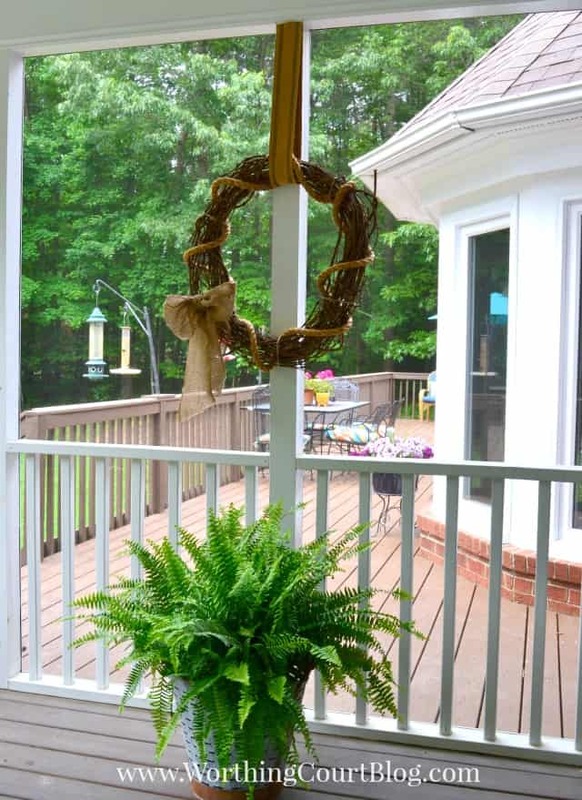 Have always desired a screened in porch, even with our NC, ” pollen plague” each springI. Your porch is one of the best rooms I have seen. 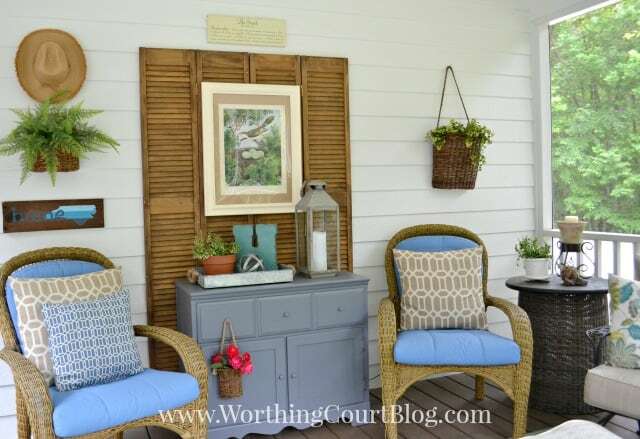 The shutters add so much and I love that you painted the cushions. Just bought some chalk paint to do a side table and had no idea it worked on fabric. Maybe I will try it on an old pair of Keds! Thanks, Suzy, for a delightful room. Your home is really coming along. As a side note…saw some great rugs from Frontgate (catalog, website, and a store location in Charlotte) that might work well in your home office and compliment the chairs. Blessings. Oh my goodness, Mary. I can SO relate to the pollen! I spent several hours a couple of weeks ago cleaning all of the yellow gunk off. I’m so glad the you like the porch and thanks for the tip about the rugs at Frontgate. I’ll check them out! 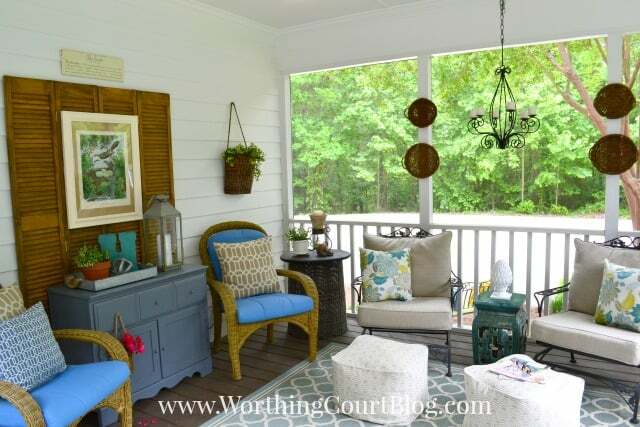 Love the transformation of your screened-in porch!! There are so many things, it’s hard to decide my favorite! I think it might have to be your corner chair….or possibly the shutter screen paired with the chest! It turned out wonderful….thanks for sharing! Thank you, Lanita, and blessings to you as well! WOW, Suzy … I’m on my way over! I love every single thing that you’ve done out here, from the fun geometric patterns, to the vignettes, to the lush greenery! I’m sure this will quickly become your favorite blogging spot! Jealous! Thank you so much, Becca. Come on over!!!!! I have a glass of ice tea with your name on it! Oh, wish I had a screened porch. Looks lovely! What a great space to entertain or relax! I may move in! What an awesome space and those shutters are awesome!! I love what you’ve done on your porch. My screened porch is a mess at the moment. We have carpenter bees boring holes on the underside of the railing, and we’ve sprayed so much bugspray through the screens, they are a mess. Hopefully, we’ll get it cleaned up really soon. It looks terrible!! In the meantime, I’ll just come share your beautiful porch!! I sure can relate to those carpenter bees, Kathy. The round wooden table top that is in the corner has several holes bored into the side of it from those pesky things. For some reason, I’m seeing a lot more of them this year. 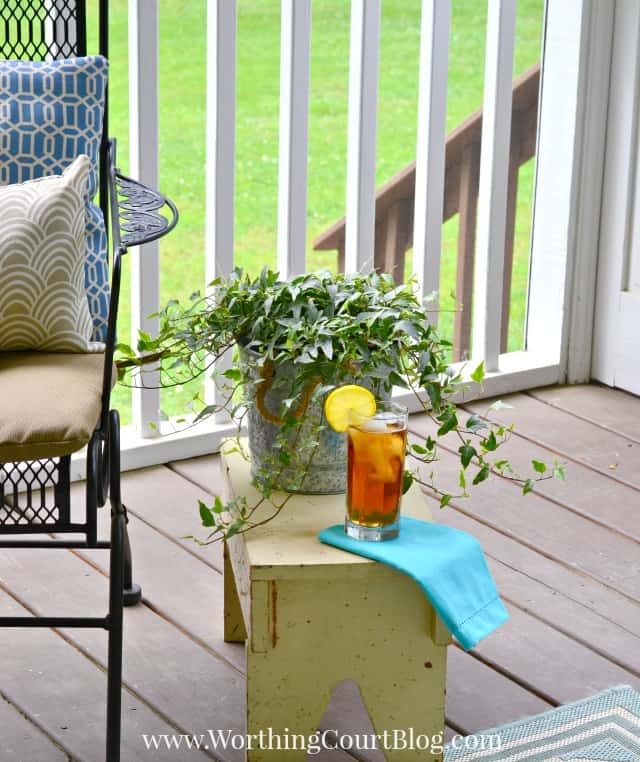 Come on over and enjoy a glass of ice cold tea! Your porch is cozy and welcoming. You did an amazing job with all the fabulous details but my favorite part are the shutters behind the dresser. Just love everything you did. Enjoy your week. Thank you, Amy. I hope you enjoy the rest of your week too. I can’t believe that tomorrow is Friday already! LOVE all your gazillion details Suzy, especially the chandy and the artwork on the old louvred doors! I also can’t believe how you transformed those chairs! What a fabulous spot to hang out and relax! Wow, Suzy, every little thing looks amazing! You did a really fabulous job. I’m sure you will enjoy that lovely space for many years to come. 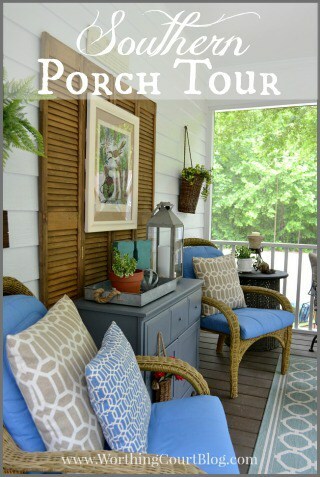 love love love everything about your pretty porch!! 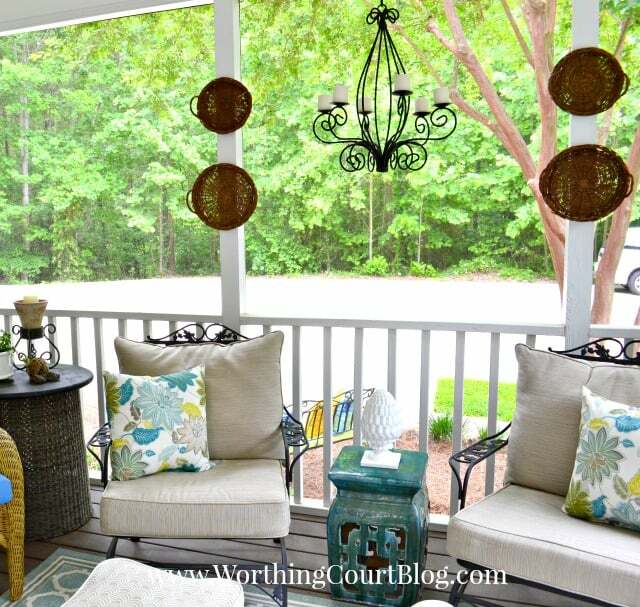 Having a screened in porch is one of my biggest must haves for a new house…love it! I love how this turned out! 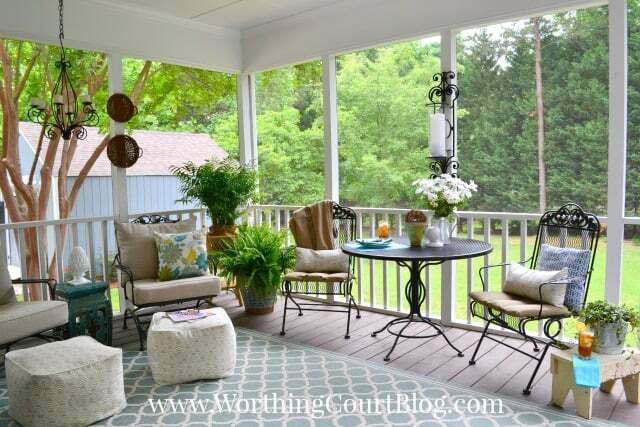 And screened in porches are so great! You can enjoy being outdoors without all the pesky bugs to bother you. Great job! 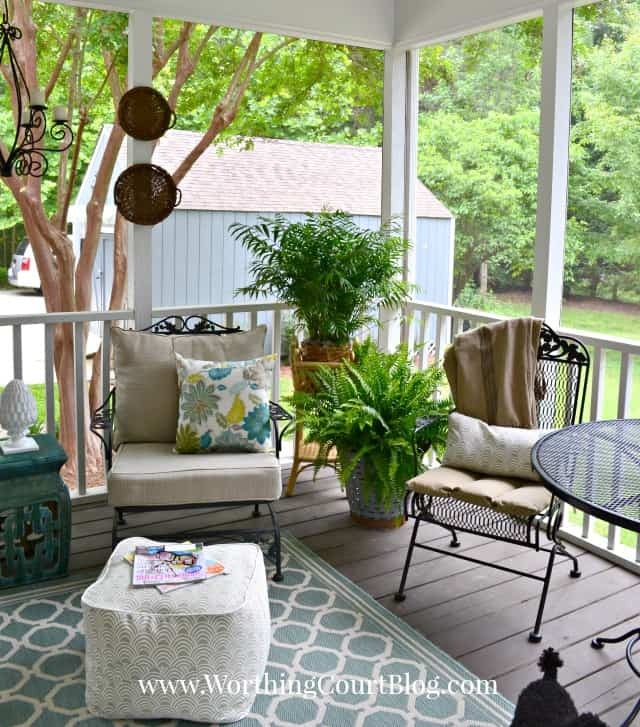 Lovely porch and you did a fantastic job with the makeover! Thank you for this inspiring makeover! Where did you find your gorgeous rug? It’s stunning and pulls your whole porch together. So pretty…I especially like what you did with the shutters. We have a brick wall next to an outdoor fireplace and I think that may be a great solution to breaking up all the brick. I so enjoy your blog! just love your porch ideas. Altho, I really say I love everything that you do. Your color choices, prints furniture selection I would love all in my home. But your 100.00 giveaway would purchase some new curtains. Redoing my granddaughters room. Looking for bunk beds now. But my major problem is our foundation. Being disabled not sure how to pay for it. Praying for intervention. 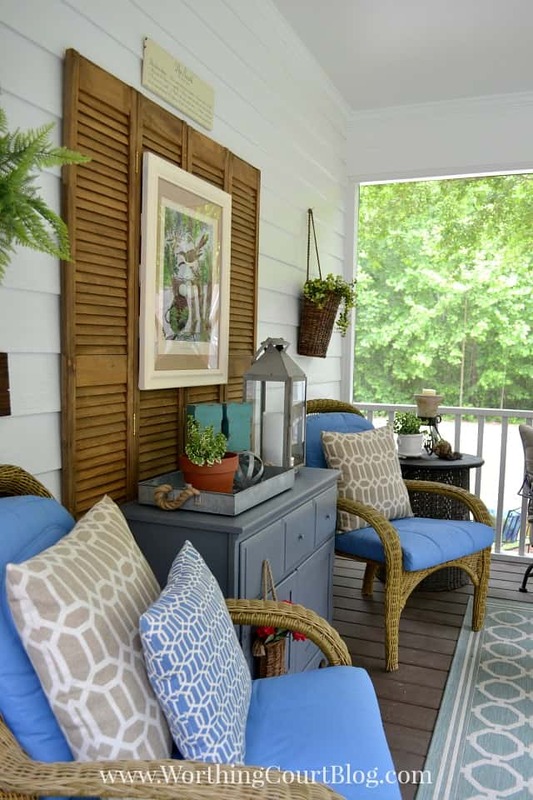 Every time I see a pair of shutters I want to buy them, but ran out of ideas. Now I know exactly what to do with them for my backyard patio!! Thank you for all of your wonderful ideas!! You were definitely put on earth th inspire people!!! Suzy, as usual, you did a beautiful job decorating your screen porch.